Karma Automotive debuted the new Revero GT at the Shanghai Auto Show this week, along with two other cars: the Pininfarina GT coupe, which is basically a redesigned Revero GT in partnership with Italian company Pininfarina, and the SC1 Vision Concept, a concept roadster that “embraces full electrification” and shows what Karma wants its designs, technology and customization options to look like in the future. The Karma SC1 Vision Concept (top) and Karma Pininfarina GT coupe (bottom). But the car with the on-sale date is the Revero GT, which Karma said would be available “during the second half of this year.” It’s the latest iteration of the car that had plenty wrong with it, but never enough to kill it: the Fisker Karma, which became the Karma Revero after Fisker went bankrupt and was bought by the Wanxiang Group out of China in 2014, in the short version of the story. The last updated version of the Karma was still bad, as of 2017. The lesson here: When in doubt, alter the name slightly and move along. Maybe no one will notice. But the 2020 Revero GT looks sleek, like the Fisker Karma did, on the surface. It’ll also make a rated 535 HP and 550 lb-ft of torque, sending the car from a standstill to 60 mph in a claimed 4.5 seconds—just over a second slower than the Dodge Challenger SRT Hellcat Redeye, for a comparison to a vehicle whose speed we can all fathom. That’s courtesy of dual electric motors and a turbocharged, inline three-cylinder BMW engine that serves as a range extender by helping power an onboard electric generator. 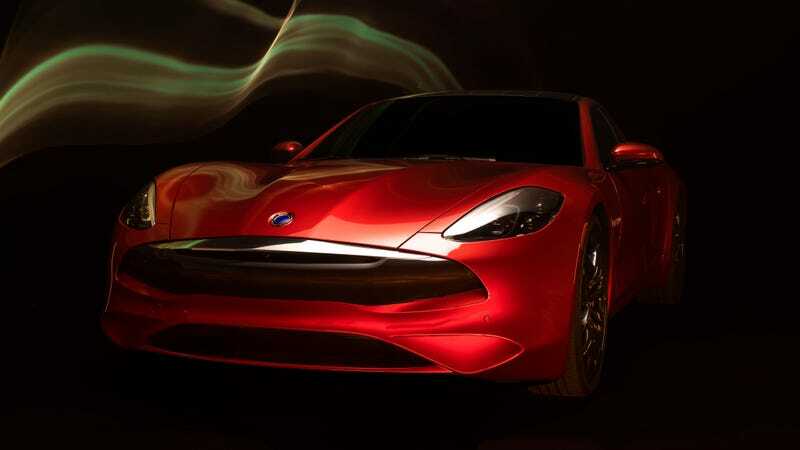 Karma Automotive claims that drivers can get up to 80 miles of electric range from the battery pack by itself, and that the number goes to 360 miles by calling upon the three-cylinder engine for help. That’s compared to the last version of the car, which used a 2.0-liter General Motors engine to extend its electric range and could go from 0 to 60 mph in a rated 5.5 seconds. It went for about $130,000, but the Karma announcement didn’t say anything about pricing for the new car. Whatever the price ends up being, the announcement said Karma Automotive wants to establish itself as a company in America first. Karma has a production facility and its global headquarters in California already, and the announcement said the idea is for the company to be in Europe and the Middle East next year, and China by 2021. That’s a long way to go in a short amount of time, but hey—maybe the Karma won’t take a detour to hell and back on the way this time around. That’s sure to shave some time off of the trip.